Young startup brands are often presented to us via press materials. Not necessarily a bad thing of course, but it gets so much better when they can show you the final product (or one as close as 99% to production ready). EZA Watches (already introduced here) is one of those young brands, which managed to let us go hands-on with their first collection, the EZA Watches Sealander. So, after the introductory story, we now have the extensive review ready for your reading pleasure! And, this is essential, we are happy to be able to bring you an important piece of news at the same time: it gets rid of the Japanese movement and will be equipped with a Swiss ETA movement. And for the same price… Not too bad, right. Now, to begin with the selected movement of the initial Sealander collection, it was something some people (including the ever-picky Monochrome-team) at least raised an eyebrow to. The initial movement was supposed to be a Japanese automatic Miyota, basically one of the widely available ETA-clones you commonly see in small, startup brands. 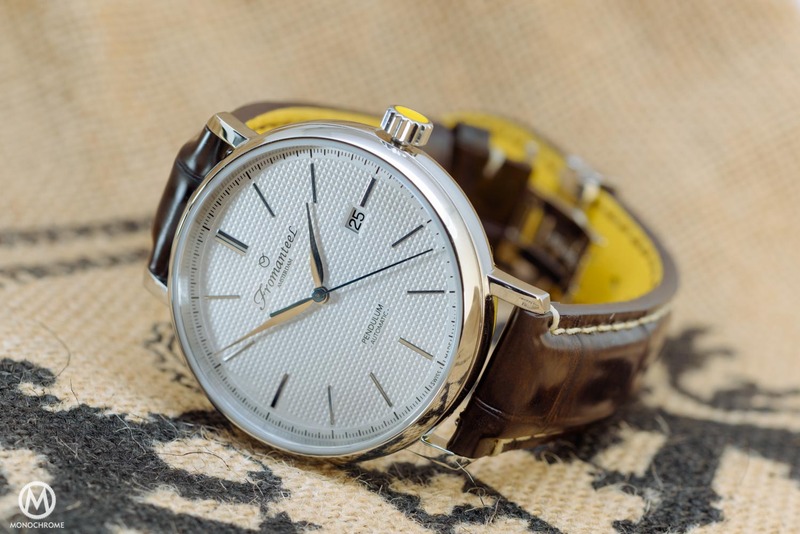 Following Baselworld though, and this was a very welcome surprise, Diederik and Adriaan (the founders) were able to announce a significant update. The Miyota was dropped and replaced with a more qualitative Swiss ETA movement. And the best piece of news…? The price will be the same as before. The history of EZA Watches dates back to an era far exceeding the age of the youngsters behind the brand. The name was resurrected by Adriaan and Diederik, and originates from the early part of the last century. Hermann Becker started the company in Pforzheim, Germany in 1921. It went bust, sadly, in the seventies as he could not fight with the decline in sales caused by the quartz-crisis – as many brands. 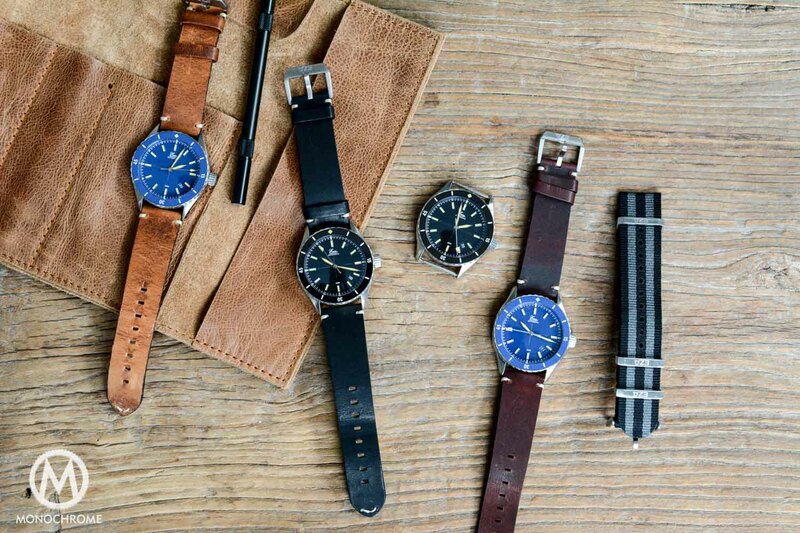 Let’s be honest, sometimes vintage inspired watches try too hard to be just that: vintage inspired watches. 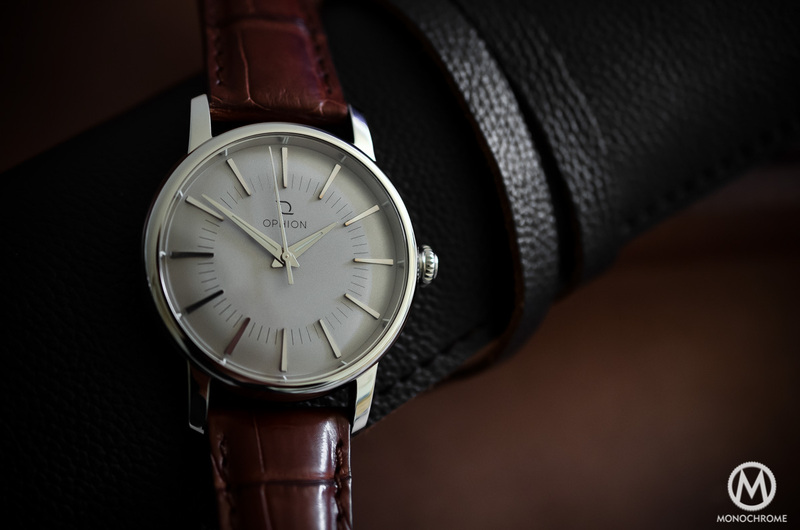 In some cases, the theme is ruined by faux-patina or unbalanced dimensions and such, and thus losing the appeal of a well-thought vintage inspired watch. 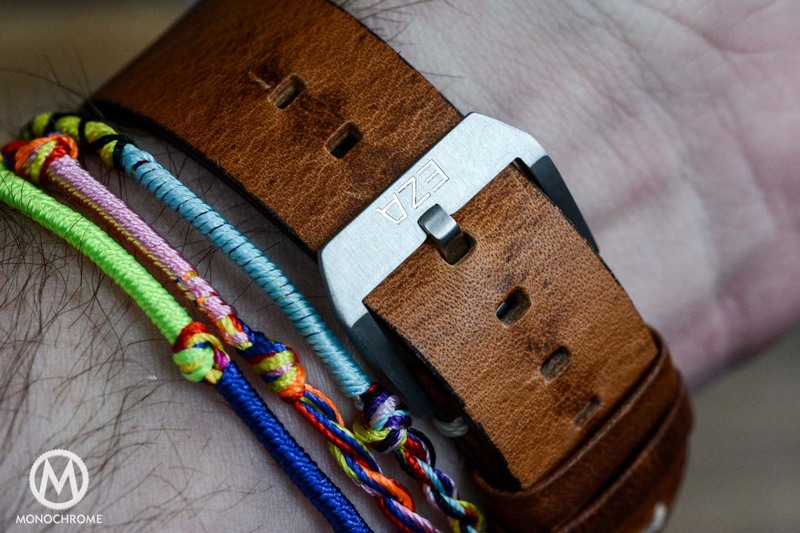 EZA Watches understood that quite well, and have created a balanced, wearable watch with a few surprising touches. It looks good, it has the dimensions to fit most people’s wrists (not too large, not too small) and doesn’t seem overly engineered or overly designed. 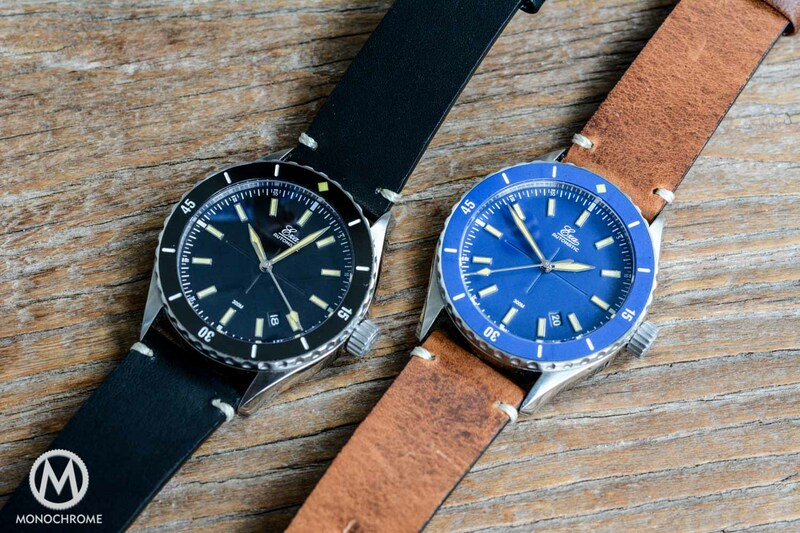 The black bezel and dial give it a smooth, inconspicuous look while the blue version is a little bolder. The blue on the dial and bezel of the EZA Watches Sealander is quite bright – without becoming too bright. Pair that with the vintage tones of the hands, markers and details on the dial and you end up with a strong looking watch, if you ask me. 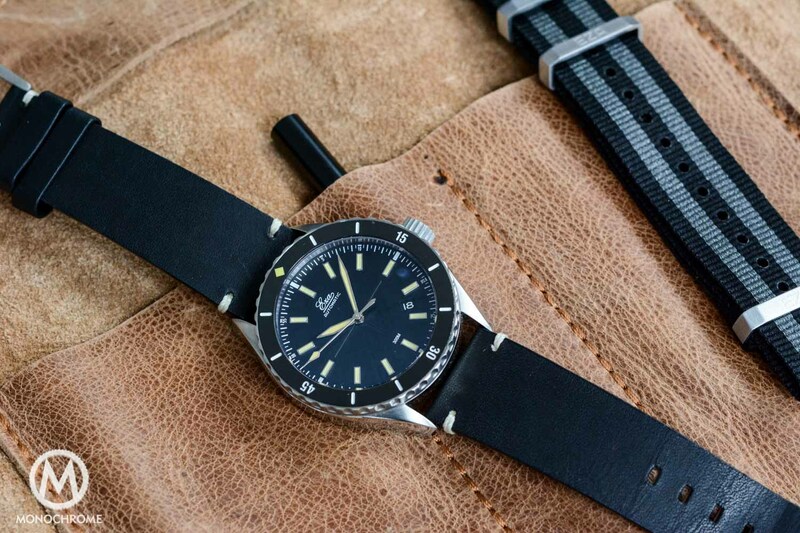 Being a dive watch, the EZA Watches Sealander is of course examined as one. Does it meet the requirements? Well, yes. Quite easily actually. It features a clean, legible dial and a tool-like built case with rotating dive bezel (unidirectional of course). Water resistance is on par too, at 300 meters. You can argue if that is enough or not, but for 99.9% of the owners, it will be. Who takes their dive watches further below the surface of a swimming pool when on vacation, or maybe snorkeling or scuba diving, raise your hand! Exactly, virtually no-one – well, only a very few of us. The EZA Watches Sealander has some more subtle tricks up its sleeve, to make it stands out from the crowd. 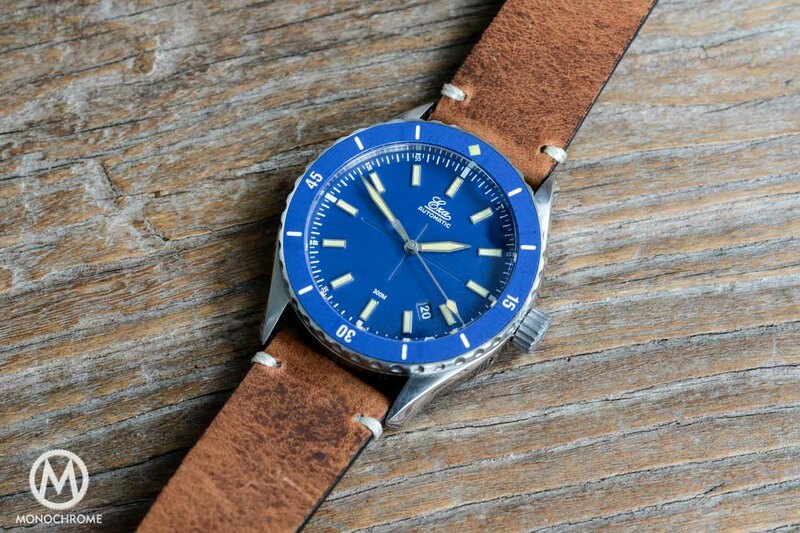 Remember, this is available at around the 1.000 Euros mark – so it has some very strong competition from well established brands (think Oris, Squale or Seiko). The most notable is the bezel, which has a ceramic inlay in either blue or black. The difficulty when using a ceramic bezel, especially in a tone other than black or white, is to match its color with the dial. No difference here though, so that is a plus! The most interesting part of the dial, in either the black or blue version, is something that is a bit hard to notice at first. It took me a couple of seconds to see it when handling the watches at the launch-party. There is a slight recessed cross on the dial, which adds a bit of character to an otherwise clean and simple dial. 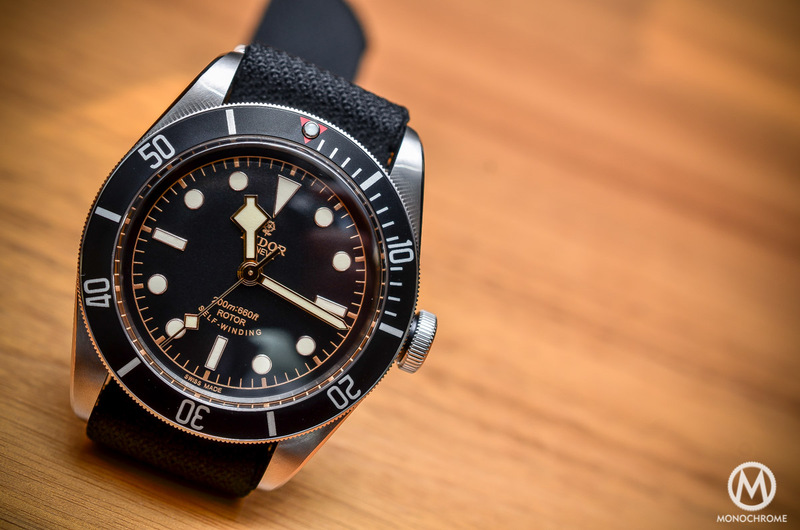 As with most (if not all) dive watches, legibility is key and the impression on the dial distracts nothing from reading the time. The rest of the dial is very legible, like said before. The shade of blue chosen is bright but not too bright, and the black is, well, black. The contrasting markers, done in a beige tone for both versions, clearly stand out against the background. The high-gloss indexes are coated with Superluminova, just as the diamond-shaped diving indicator on the ceramic bezel. On the outside perimeter of the dial you can see a printed minute track in white to complete indications. The brand’s logo is also done in white, and is placed in the top half of the dial. The sword shaped hours and minute hands are coated in the same color as the hour markers, as is the diamond shaped tip of the seconds hand. This seconds hand runs almost to the outer edge of the dial, a design touch I always appreciated, although I can’t exactly explain why. I guess it somehow completes the design for me. The EZA Watches Sealander has a 41mm wide stainless steel case, with some nice touches. It is nothing extremely complicated or extra special but a good, honest steel case. Like just about anything with this watch, it perfectly fits the price bracket the watch is positioned in. The strap of the EZA Watches Sealander can be black, dark brown or cognac leather, vintage-style, with minimal stitching. These straps are nice and soft, and fits with the vintage theme. The second strap that comes with each and every EZA Watches Sealander is a NATO strap, in grey and black Bond-like style, with bespoke EZA Watches hardware. This is perhaps the biggest piece of news to share, following our introductory story back in march. The Japanese Miyota movement has been axed! The fact that a watch costing 849 Euros comes with a Miyota movement is something many regarded as ludicrous. It was said to be too expensive, too pricy to be justified as a purchase and it would probably never sell! People disregarded however, that the Sealander has a lot to offer besides the movement. Obviously it is a very important part of the experience, and thus always a topic of discussion – but still, give the brand a fighting chance! Well, it seems that now EZA Watches has given EZA Watches a fighting chance themselves. During Baselworld we met with Adriaan and Diederik, during our annual Schnitzel Dinner, a perfect place and time during the hectic week to catch up with some of the industries closest friends and partners. It is during this evening that they informed us they secured a deal that allows them to equip the Sealander with a Swiss ETA movement. The ETA 2824 that will be used is a tried and tested workhorse so I won’t go into the specifications too deep, but is might be worth mentioning that, in the case of the EZA Watches Sealander, it is adjusted to 6 positions. It is a good thing to know that the watch will run for roughly 40 hours on a full wind of the barrel, so you can leave it on your nightstand for a day or two and not worry about a thing. 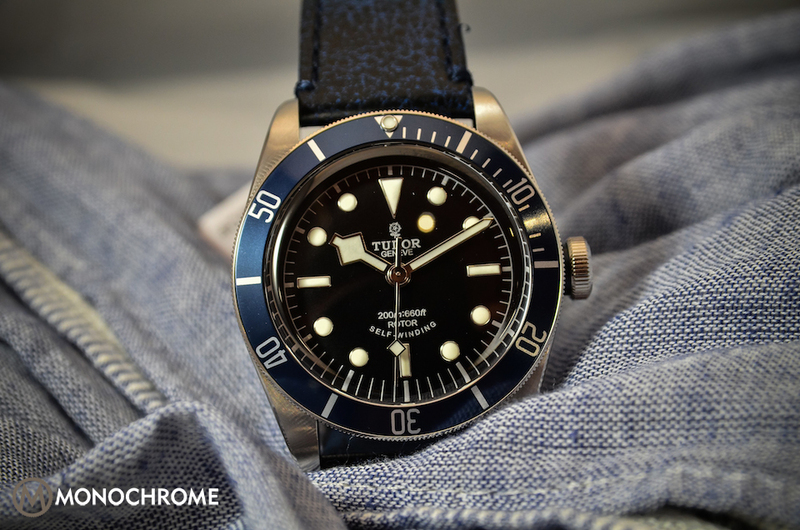 Or you could just keep wearing this simple, sophisticated vintage inspired diver. With the drop of the Miyota in favor of an ETA, not much to be honest. Regardless of which version you like more (black versus blue) you get quite an impressive product for your 849 Euros. 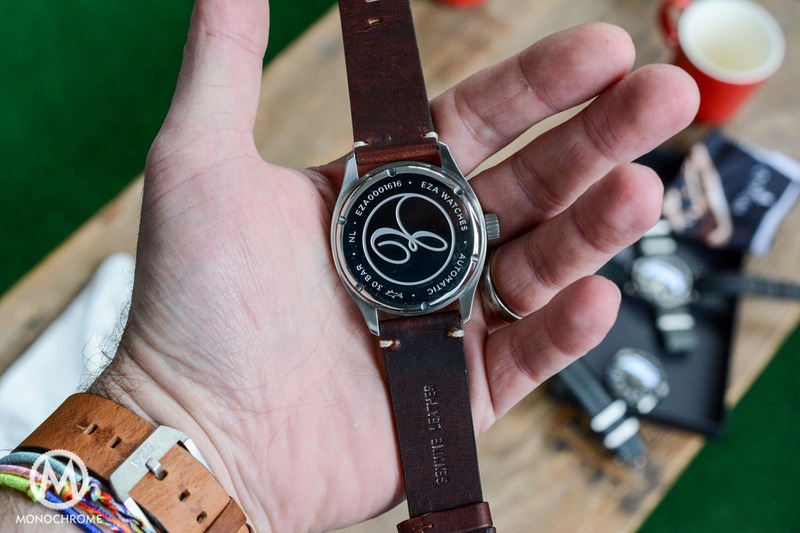 The package deal includes the watch, delivered on a leather strap. 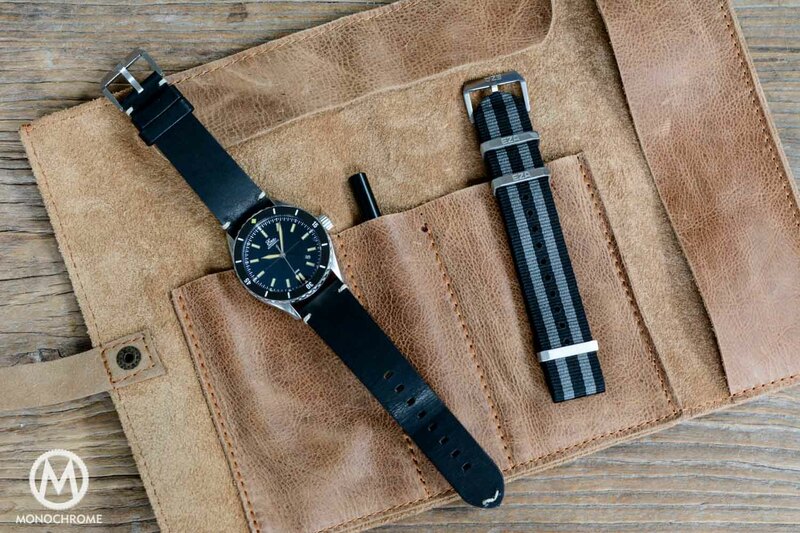 Next to that, you also receive a watch roll to store your watch, and an additional strap tool and a Bond-style NATO strap. With custom EZA-hardware. An added bonus is a full movement service after three years which is something you’ll never see. For orders and more details, eza-watches.com. 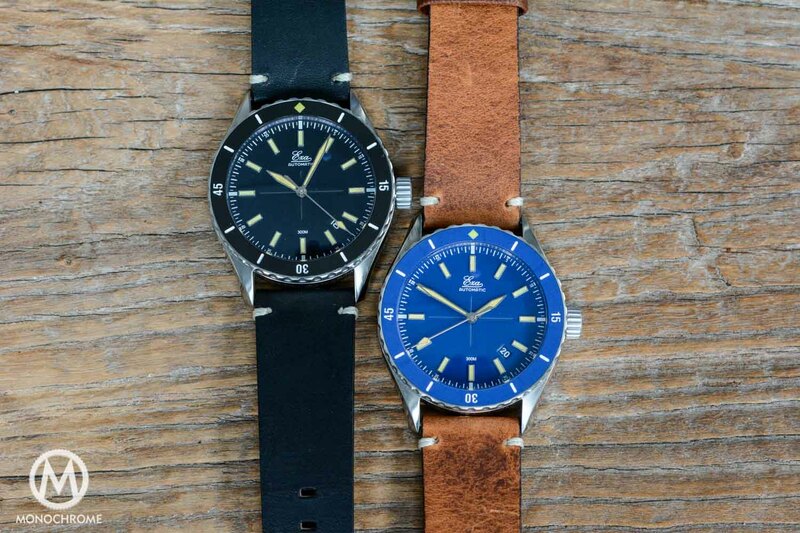 If you can buy an Oris Aquis for the same price, why bother with a micro-brand? Nice review. I am in the market for a diver under 1k euro. And to support the local startups I already had this on my screen. But how does this compare to our other local heroes of TWCO with their Sea Rescue Diver? They are using a Miyota 9015 that you are more or less dissing in this review in favour of the ETA. Are the differences in movement quality that big? Especially since TWCO is operating in the same price range. Other than that I like the design a lot. Only missed opportunity in my eyes are the straps that are not really intended for diving/swimming. Why is that? 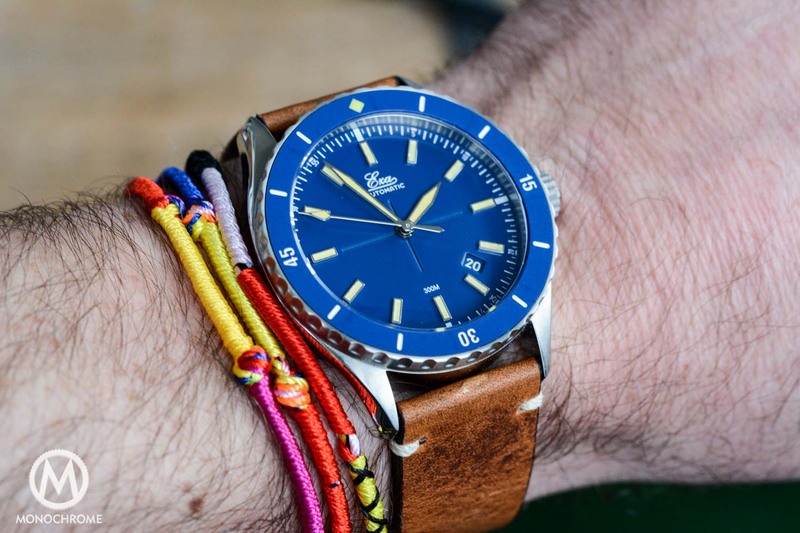 Why not deliver the watch with a SS or rubber/urethane bracelet and add the leather one as an extra? We’ll have a closer look at TWCO later, however in general you can say that Miyota movements are less precise and of lesser quality. Nothing wrong with Miyota movements, just less nice finish and less precise. A nice extra that Eza offers, is the free service after 3 years! Very handsome watch indeed. I wonder how German it is – since they didn’t pass the “Made in Germany” certification. Does this indicate that the watch is actually made in China? 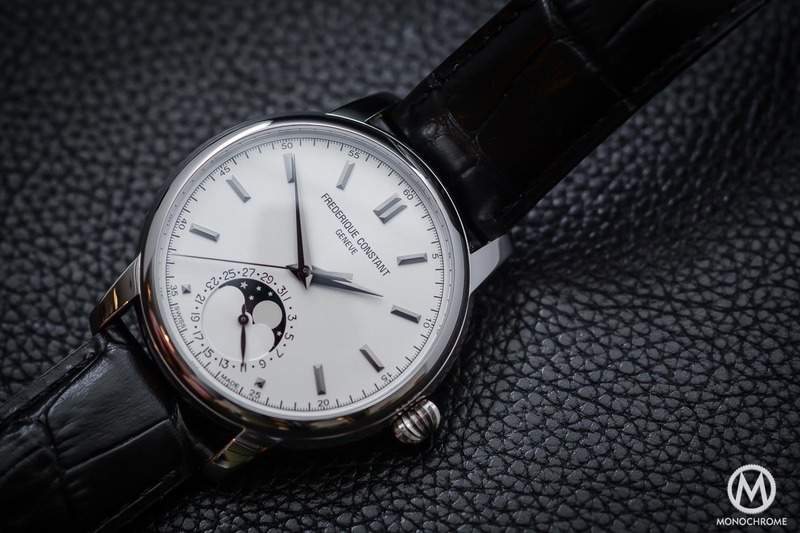 The movement may be Swiss, but the case, dials, hands – are made in China most probably. Interestig? Yes. Affordable? No…In that same price range I bought a Christopher Ward C60 Trident Vintage, with Sellita mvt and over a month now, is extremely precise! 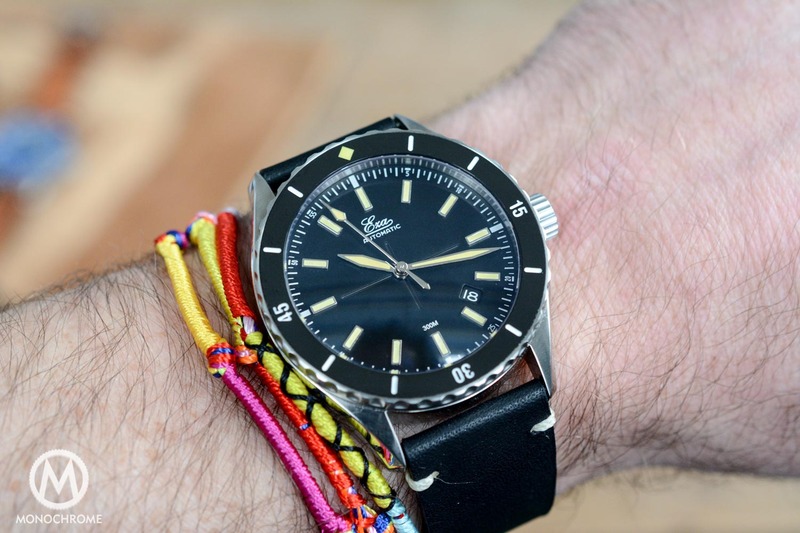 Also I bought a Squale 1521 with ETA 2824 (this one gains 1mit/month). I think that a price 500-600 euros would be more appropriate. UPD: Sorry – I see the facility is in Netherlands. I really like the specs, ceramic bezel, ETA movement, adjusted in six positions, 300M and the complete package make it a cool toolwatch. Wow! Like the review. Great watch and the price with all the extra’s is really good imho. Thanks for bringing to our attention a startup brand that is trying to find its place in low-mid divers market. It is always good to give visibility and a chance to new brands with a good growing potential. 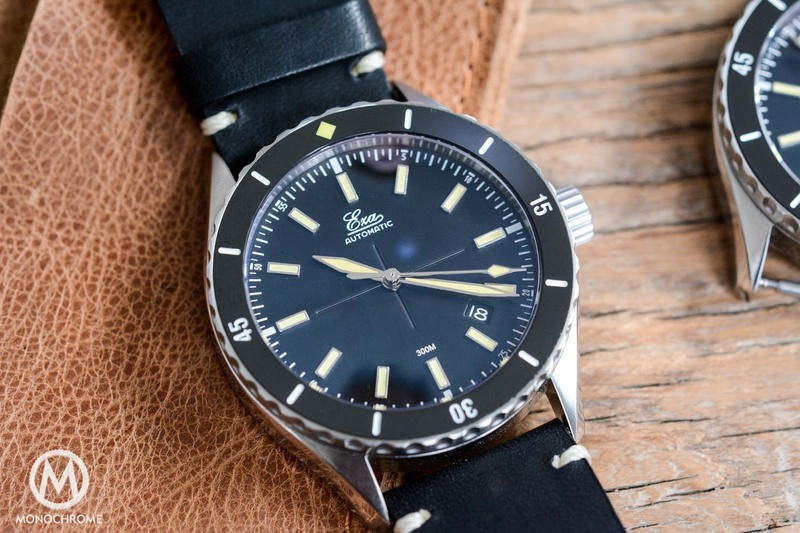 In my opinion, aside from the japan/swiss movement reliability discussion (everybody has its opinion), the watch is a bit overpriced since there are good alternatives for a similar price (first example i’ve got in mind is the already mentioned Oris). Also the lack of a technical strap/bracelet for a supposed divers toolwatch timepiece is a bit odd. I think that leaving the customer the alternative to choose between two movements at different price points (as did Laco for instance) without changing the other specs would be a good commercial policy. Wow, nice watch! If I wanted to buy a watch in this price category, I would really consider this one. The details are amazing and the price of 700€ with ETA is spot on. A very nice affordable watch in my opinion and glad they changed the movement. Given the specs and the complete package, you can tell its designed by watch fanatics. So an ETA movement suits better for that matter. 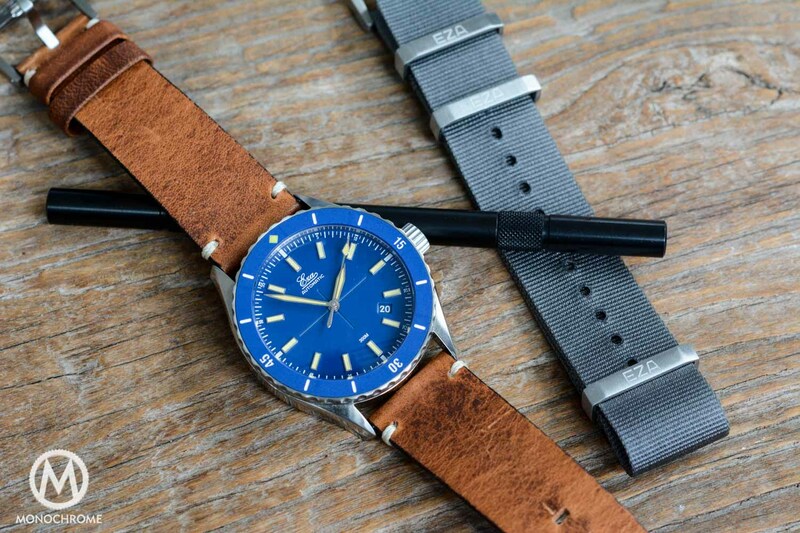 The good thing here is the design – a lot of dive watches are really busy (including the Oris Aquis and TWCO – the modernized look is nice, but what I love is how clean and simple and classic the look is. I wish more watchmakers made the look this simple and minimalist, especially in a tool watch. 900 USD is a high price to pay for sure for a microbrand, but I can see the value when you look at the design choices. I wish it had a metal bracelet option, though. will the landing cost be 900 $? ?